A Hawke’s Bay woman laughs when people ask to speak to her husband about every-day decisions on the farm. Kate Taylor interrupted her at work in the sheep yards to find out why. One of the first things Hawke’s Bay farmer Caroline Smith does when she stops for a cup of tea after drafting cull ewes is to breastfeed baby Clara. She juggles looking after a young family and farming 240 hectares and loves it, although one of her pet hates is having people phoning on farm business asking to speak to her husband. Many South Island rural contractors have had what they are describing as “a season out of the box” with outstanding silage, hay and balage crops made so far this summer. It is a different story in the North Island where generally harvests have been later and patchier. New Zealand president Steve Levet, of Wellsford, told the NZ Farmer weather conditions during spring and early summer in the north had generally been colder, wetter and windier than usual. . . The Farm Alliance app, developed as part of the cooperative’s business strategy, provides a range of resources for farmers to help them manage the processing of their stock. Farmers can now see their own livestock processing results in real time, access their latest kill sheets, make booking requests, check statistics and schedule and receive industry updates. Mark Blandford, chief information officer at Alliance Group says it is constantly looking for new ways to help farmer shareholders with their businesses. “Farmers can get their kill sheets delivered straight to their mobile phones as soon as their stock is processed and they will be automatically notified when new information is available. “The menu also includes all of a farmer’s kills for the previous six months and annual kill statistics. . . Giant piles of black manure towering over cornfields, while rancid-smelling effluent from thousands of cows spills onto the land—this is the price of a glass of milk in China today. Large-scale dairy farms have boomed in the Asian giant, as its near 1.4 billion consumers overcame centuries of cultural reluctance to embrace the white fluid. An economic boom and government backing transformed dairy into a $40-billion-a-year industry, shifting production away from small-scale producers towards massive megafarms with up to 10,000 cattle—and a lot more waste. . . Beef might taste delicious, but producing it exhausts our planet’s land and water. As a result, more chefs and retailers are searching for alternatives that taste like beef — including insects. Starting May 2017, Coop, one of Switzerland’s largest wholesale retailers, will start selling “burgers” and “meatballs” — both primarily made from mealworm larvae — at select grocery locations. It will partner with Essento, a Swiss startup that makes food from insects, Switzerland’s the Local reports. . . In exciting news announced today, a group of private investors have established the New Zealand Chinese Jockey Club to cater for the high level of interest in racehorse ownership by the Chinese community, both here in New Zealand and internationally. Headed by Mr Joshua Zong, a prominent Chinese business owner and property developer based in Auckland, the New Zealand Chinese Jockey Club will be officially launched on the eve of New Zealand Bloodstock’s National Yearling Sales Series at a function to be held at the Karaka Million Twilight Meeting on Sunday 29 January at Ellerslie. . . The 2015/16 kiwifruit season broke records for the industry and Zespri with the biggest-ever total return to growers, highest-ever Green return per hectare and record sales volumes for both Zespri Green and Zespri SunGold Kiwifruit. Zespri Chairman Peter McBride explains total sales revenue for the season also grew to hit $1.9 billion, up 21 percent from the previous season. The total fruit and service payment to growers for New Zealand-grown fruit increased 22 percent on the previous year to $1.143 billion, with average return per hectare reaching a record $60,758. . . The Financial Markets Authority (FMA) has concluded its assessment of complaints received about Silver Fern Farms Limited (SFF) and will be taking no further action. The FMA received a small number of complaints in April 2016 relating to Silver Fern Farms Limited and documents released to its shareholders in September 2015. A complaint was also made about the resolution approving the transaction with Shanghai Maling Aquarius Co. Ltd (Shanghai Maling). The FMA considered whether information sent to SSF’s shareholders could be substantiated and concluded that SFF’s Notice of Meeting and Shareholder Information Pack, dated September 2015, was not misleading or deceptive. . .
A new multi-million-dollar marketing campaign has begun to educate Australian, Chinese and ultimately U.S consumers on the health benefits of New Zealand’s grass fed dairy products. The international campaign has been launched to raise awareness of the benefits of consuming milk products from grass fed cows over those raised organically. It’s all part of the introduction of new Munchkin Grass Fed™ milk-based formula and toddler drinks. Milk matters because it is the key ingredient in infant formula and toddler milk drinks, constituting up to 65% of the powder. . .
Goods exports rose 4.0 percent in April 2016, up $166 million to $4.3 billion, Statistics New Zealand said today. Fruit exports led the rise, up $59 million (16 percent), offsetting a similar fall in dairy values. Gold kiwifruit rose $53 million (53 percent), but was partly offset by a fall in green kiwifruit, down $38 million (35 percent). Apples rose $39 million (29 percent), with apple exports to Taiwan up $16 million (91 percent). Taiwan was New Zealand’s top destination for apples in April 2016, beating out the United States and the United Kingdom. Among other export commodities, untreated logs, foodstuffs such as dietary supplements and savoury fillings, and beef and lamb all rose in value this month. . .
(BusinessDesk) – New Zealand manuka honey products maker Comvita is linking up with Blenheim-based apiary operator Putake Group to form a South Island-based honey business to meet global demand for manuka honey. The companies have signed a memorandum of understanding to form a 50:50 joint venture, named Putake Group Holdings, which would develop a wholesale honey business in the South Island, Te Puke-based Comvita said in a statement. Putake owns 1,200 hives and manages another 2,800 hives through separate joint venture arrangements. . .
As the agricultural sector grapples with high levels of dairy debt and increased volatility, Crowe Horwath’s Head of Agribusiness, Neil McAra, says farmers need to look at getting sound governance support. McAra is a strong advocate for advisory boards which can assist farmers with the ability to make better decisions and can help improve business governance. The value, scale and complexity of New Zealand farming operations have increased significantly over the last two decades. . . Rural Contractors New Zealand (RCNZ) is encouraging all of its members – and any others interested in the agricultural contracting sector – to attend its annual conference being held in the Bay of Islands later next month. Chief executive Roger Parton says this year’s RCNZ annual conference is being held at the Copthorne Hotel and Resort, in Paihia, from June 27-30. “The conference is now only a month away and for those who have not registered yet; now is the time to do so,” he explains. “We will be unable to hold any accommodation past the end of this month, so if people want come they need to get their registrations in now.” . . The prospect of getting out of bed at 5am to gain work experience on a dairy farm does not bother Caleb Unahi. The 19-year-old is enjoying keeping busy as part of the Farmhand training programme, which aims to expose Dunedin’s disengaged youth to rural opportunities. Before starting the 13-week course, Caleb was doing ”nothing much really”, he said. A family friend encouraged him to apply for the course, which was first held last year. he said, while learning about fencing at Invermay recently. . .
A couple described as vital cogs in the fine wool industry had their efforts recognised at the weekend. 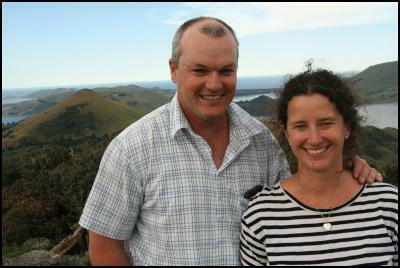 Peter and Elsie Lyon, of Alexandra, received life membership to the New Zealand Merino Shearing Society. The award – a surprise to the couple – was made during the national merino shearing championships in Alexandra on Saturday night. The couple run Peter Lyon Shearing, which had a turnover of more than $10 million last year. . . I am very lucky to live on a high country Merino sheep station here in Tarras, New Zealand. This farm belongs to my husbands family and they have farmed here for over 100 years, which is a long time in NZ! Every year in the first week of September a big muster happens and the sheep are brought down off the hill and into the woolshed to get their yearly hair cut in time for the hot Central Otago summer. This wool is very carefully removed by highly skilled shearers, who have the very tricky task of removing the precious fibres without harming the wrinkly sheep. Canterbury farmers have been given another three weeks to enter this year’s Ballance Farm Environment Awards. The entry deadline has been extended to Friday October 30 to allow farmers more time to get their entries in before judging commences in November. The Canterbury Ballance Farm Environment Awards Judging Coordinator Sandra Taylor acknowledged that drought and a low dairy pay-out have made for a tough start to spring and for many farmers entering the Awards has been low on the priority list. She points out the judging process gives farmers the opportunity to benchmark their businesses and get feedback from a team of experienced and knowledgeable judges. . .
Cam Bray of PGG Wrightson won the 2014 Competition after entering all three years of the competition. The win enabled him to travel to the 2015 Sydney Royal Show to attend the Australian Livestock & Property Agents Association (ALPA) Young Auctioneers National Final. Mr Bray said that the trip to Australia resulted in some life-changing experiences. “The trip to Australia was great – not only for the fact that I was representing New Zealand but to be able to rub shoulders with Australia’s best was an invaluable experience.” . . . Agricultural contractors around New Zealand will soon be able to bring in overseas workers much easier than in the past – following a deal struck between its national body and Immigration NZ. Rural Contractors NZ (RCNZ) president Steve Levet says his organisation has been working with Immigration New Zealand for a long time in an effort to resolve the problems around contractors bringing in overseas workers for the harvest season. “After many meetings and a lot of hard work by RCNZ – together with Immigration NZ – we believe have come up with a solution that will solve many of the problems that rural contractors currently experience every year and make it much easier to bring in overseas workers,” Mr Levet says. . . Anyone who owns a ‘qualifying forest’ of between 4 and 1000 hectares, planted before 1 October 2003, may vote in the election that opened on Monday 5 October and closes on Friday 16 October. . . .
Data collection and data integrator specialist business DataCol Group, today announced it had fully acquired Canterbury-based Watermetrics, a provider of integrated water flow monitoring, recording and analysis services. “Watermetrics were pioneers in providing water measurement technology and services to the rural sector, have built a strong brand and significant customer base predominantly in the Canterbury region off the back of that,” says DataCol CEO Bruce Franks. “Using data collection and measurement technology has become a critical tool for farmers in terms of enhancing productivity, reducing cost and complying with national regulations like water consents. . .
After almost six years in business – and a consistent winner of many sustainable practice awards over the years – Ziptrek received the award on Friday night, helping set a benchmark of excellence within the New Zealand tourism industry. Judges were hugely impressed with the business, describing it as a “wonderful example” of a highly successful tourism business embracing and promoting sustainability in everything it does. . . Capping off a stellar season, Queenstown’s Coronet Peak fought off stiff competition to win the Visitor Experience Award at the New Zealand Tourism Industry Awards this weekend. The ski area celebrated its final ‘hurrah’ on the snow this weekend with a Rugby World Cup-themed day in support of the AB’s on Saturday. On Sunday, all best efforts to host a Beach Party were somewhat thwarted by wet and wild weather, but a few brave souls managed the Pond Skim to cap off an amazing season. The final weekend of 2015 winter started well, with Coronet Peak ski area manager Ross Copland accepting the honour in Auckland on Friday night. . .
Modern agriculture, at about 70 years old, was the product of post WWII food shortages and while it had been effective in its primary aim of increasing yields it has to change, an industry expert says. The 2020s would be the new 1960s as agriculture and social change entered a period as significant as the 1950s and 1960s, Dr Charles Merfield of the Biological Husbandry Unit’s Future Farming Centre said. “Our times are once again changing,” he told farmers at a sustainable agriculture seminar run by the FFC and the Foundation for Arable Research in Ashburton. . .
As Trans-Pacific Partnership (TPP) nations meet this week in Guam to continue negotiations, agri-food producer and processor organisations from Canada, the United States, Australia and New Zealand remain united in their call for a modern trade agreement that includes meaningful and comprehensive market access opportunities for agriculture and agri-food. The organisations advocating for an ambitious, fair and comprehensive TPP agreement are the Canadian Agri-Food Trade Alliance, the American Farm Bureau Federation, the Australian National Farmers’ Federation, and the Federated Farmers of New Zealand. Together, they represent hundreds of thousands of farmers, producers, processors and exporters who, in turn, employ millions of workers across the TPP region. “Our agricultural sectors and the jobs they provide depend on a thriving network of export markets,” said Brian Innes, president of the Canadian Agri-Food Trade Alliance. . .
Federated Farmers says it’s disappointed there is no Budget surplus this year, but the best news for farmers from the Government is that it is on track for a surplus next year. Acting President Anders Crofoot says Federated Farmers welcomes a number of measures in the Budget, but the best thing to assist the rural economy is to control government spending enough to create an enduring surplus to enable debt repayment and to keep pressure off inflation, monetary policy and the exchange rate. “The Government is clearly trying to balance the need to responsibly manage its finances with the pressing and growing demands to do something about housing and child hardship.” . . The Dairy Companies Association of New Zealand (DCANZ) has welcomed the 2015 budget announcements in support of better biosecurity outcomes. “Short of a major volcanic eruption in Auckland there is very little that trumps the impact that a biosecurity incursion could have on the New Zealand economy. A bad biosecurity incursion would shut down exports and derail much of our country’s productive capability.” says DCANZ Chairman Malcolm Bailey. “Unlike a volcanic eruption, there are things we can do as a country to lessen the risk of a biosecurity incursion. DCANZ thanks the Government for its commitment to responding to the changes which are altering New Zealand’s biosecurity risk profile.” . . .
(BusinessDesk) – New Zealand wool prices jumped to multi-year highs at auction even as the volume on offer rose 78 percent, amid strong demand from exporters. The price for clean 35-micron wool, a benchmark for crossbred wool used for carpets and accounting for the majority of New Zealand’s production, rose to $6.20 per kilogram at yesterday’s South Island auction, from $5.80/kg in the North Island auction last week, and reaching its highest level since November 2013, according to AgriHQ. Lamb wool jumped to $6.90/kg, from $6.65/kg, marking its highest level since April 2011. . . Rural Contractors New Zealand (RCNZ) is encouraging all of its members – and any others interested in the agricultural contracting sector – to attend its annual conference being held in Blenheim later next month. Chief executive Roger Parton says this year’s RCNZ annual conference is being held at the Marlborough Convention Centre, in Blenheim, from June 22-25. “The conference is less than a month away and for those who have not registered yet; now is the time to do so,” he explains. “We will be unable to hold any accommodation past the end of this month, so if people want come they need to get their registrations in now.” . . .